On December 6, 2007, you passed from your mother to the womb of glory, forgoing planetary existence entirely. On April 2, 2008, which would have been your birthday, your mom, dad, and I prayed, reminded the universe that you were, and stood in a cemetery. We needed to let grief have its way with us—your mom, Liz, especially—out in the open air, before heaven and earth. Only this morning did her sadness settle upon me, the breadth and depth of it. She and I talked for a few minutes last night after a meeting, and what she said woke me up at 5:30 this morning. Right away I felt the need to thank you. Because your life kissed Liz’s en route to mercy, I’ve been granted a truth. This isn’t a maxim, like “a penny saved is a penny earned,” but a truth that’s part of eternity’s cosmic dance. So . . . the truth your mother spoke, not with words but with her eyes: we are loved into the world. Why did it take me fifty-two years to realize this? Even a dullard can detect pregnancy: swelly belly; the third-trimester waddle; puffy feet; pink cheeks. And women generally know not to smoke, drink, and do drugs while carrying a baby. During labor, breathing through contractions is common knowledge, so much so that it’s become a joke: Whew! Whew! Whew! Whew! Whew! But what you and your mother have taught me, Noah, isn’t a lesson of body, but spirit. Mothers and fathers, grandmothers and grandfathers, and aunts and uncles don’t just get excited about a new arrival; they fall in love. While your digits were still forming, you were loved. Hundreds of times while you were kicking and shadow boxing in your mother’s womb, she held you in her soul, rested her lips against your sweet face, breathed in your newborn scent, still carrying whispers from God. And her love—so you and she have shown me—collaborated with biology to nurse you toward life. Now you would be six years old. This morning as I lay awake before dawn, I dreamed you. You would have the full face of your brothers Mitch and Gabriel and fine, blonde hair. Pretty soon, I would pull a chair up to the altar, and you would help me set the Communion table. You would raise your hands with the other Abiding Hope kids to bless the people. Your father, Shawn, would chase you around the church, maybe telling you to slow down. In this dream, love for you catches in my throat. But my dream can’t compare to your mother’s. She dreams you all the time, and while I imagine clowning around and making you laugh, she dreams you with her body. Biology failed you, but your mom still feels the space in her arms where you should now find comfort. I’ll also bet the love that willed you toward birth still dwells in her womb. “Push,” it pleads, “push!” The longing is so profound it doesn’t stop, even though you are gone. Oh, Noah! Do you understand from the lap of glory how you are loved? Still, I have to tell you, your beauty comes at a price. When you died, your mom, dad, and others who counted on your arrival could hardly bear it. “God,” they cried, “why would you take Noah from us?” Sometimes they shook their fists and swore at God, which I believe is the best possible prayer when that’s all you’ve got. Maybe you could check on this for me: God loves us beyond our doubts and rage, right? You could also ask if I’m right that God didn’t take you as part of a divine plan and doesn’t constantly make folks climb through barbed wire to test them. But I shouldn’t be greedy. You and your mother have already blessed me with one answer: We are loved into life. Gracias, little senor! I’m also grateful that you have opened me up to other lessons about love that grow from the soil of your teaching. That’s how my mind works: I dig for truth and find species of it gathered in one small garden. 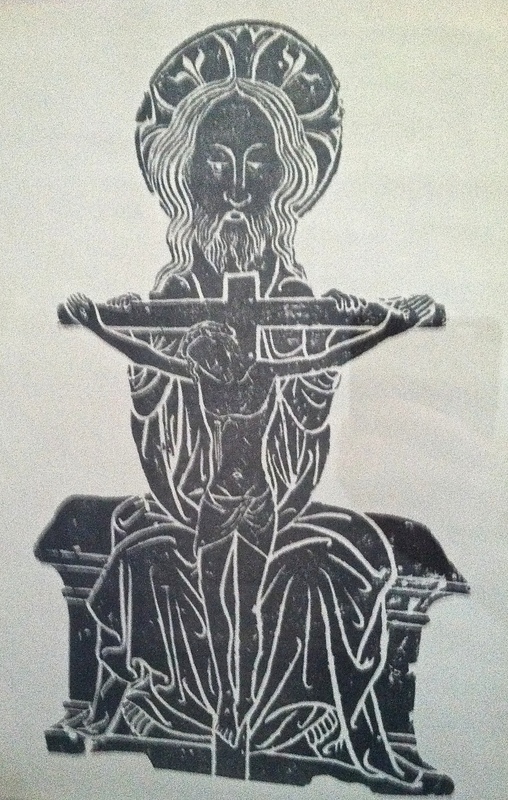 My friend Diana gave me this rubbing a long time ago. Looking at it makes me wonder about the face of God. Please ask God to smile upon us and be merciful. Some lessons are necessary, but damned difficult. You’ve taught me that I would rather have my loved ones safe beside me and suffer all other scarcity than know material abundance and empty arms. Love is as necessary as clothing and shelter. Intercede for all of us, Noah. Hold God’s hand as we—our boy’s parents and all who love him—throw haymakers at heaven and demand answers. Love longs to be spent. I think lots of us are formed and fired to be vessels for love. If enough of it builds up without finding a good recipient, we show cracks. In recent years I’ve spoken with a couple of women who wanted to bear children. One told me after drinking an iced-bourbon truth serum that she regrets not having children. “I think I could have been a good mother,” she said through tears. And she would have been—nervous, worried, but as attentive and understanding as any mother in circulation. In her sixties now, she looks across the expanse of years and holds open hands that would have always touched daughters and sons with gentleness. Another friend tried for years to get pregnant, without success. She heard stories of unwanted babies cruelly discarded and thought, “I’m right here! I’ll love your baby. Just bring him here and leave. Nobody has to know.” For both these women dear to me, adoption wasn’t an option. Love lands where it pleases. An old friend of mine is selling his house and moving into a senior apartment complex that doesn’t allow pets. He gave his dog to a kind friend, and on the first night in her new home she dug a hole under the fence and escaped. Sleepless hours passed until the next morning, when my friend stopped by my office with good news. The dog returned and was sleeping in the laundry room of her new home at daybreak. “Last night I did something I haven’t done in a long time,” he reported. “I got on my knees and prayed.” The thought of his beloved dog confused and afraid in woods and fields was torture. I bet for a while my friend will go to pet his dog and feel grief when he remembers she lives with someone else now. We love what we love, I guess: dogs, meadows, goldfish, blue heron, homes, clematis vines, neighborhoods. Noah, you might ask me, “How can you love me, John? You never even met me.” Because that’s how love works, buddy. It writes its own rules, in its own time and at its own pleasure. And it’s under no obligation to make sense. “I got on my knees and prayed.” That’s it! Love brings us to our knees. That’s what you and your mother taught me, along with leaving me a question. I wonder if great minds over the centuries have uncovered only the scientific truth about the origin of universe. Maybe there’s a second truth. What do you think, Noah? Were the suns and planets and beating hearts of each galaxy loved into space? And is that love still sending us out for billions of years until it calls all that exists together again to be embraced—blood, bones, fire, and stardust? You’ve got me wondering, kid, wondering and believing. Who could have imagined that a boy who never held his parents’ hands and walked barefoot on wet grass or woke up in the middle of the night afraid would be wise enough to grant a grateful man truths to live on. Thanks, Noah. Give God a kiss for us. John, no apologies necessary! Get that book done so I can get my hands on it! I once saw the most beautiful sight in Tanzania. It was a mud hut absolutely covered in wild colors of Bougenvillia. I read this and just know your heart is even more beautiful than that, John. What a wonderful thing to say, Mark. Thanks, brother. I’ve got nothing but love for this little bit of writing and for the guy that puts it all together. Thank you for making me stop thinking so much, and feel a little bit. I had a wonderful subject to work with. Thanks, brother. It is beautiful. It made me think of that old Joni Mitchell song “Woodstock”. Agreed. So much of her music is truth is beauty. Love her.